Body temperature is maintained at 37°C as a result of balance between heat generation and heat loss processes. This balance involves autonomic nervous system, metabolism, and behavioral responses. According to a 1992 study published in the Journal of the American Medical Association, humans are able to maintain an average healthy body temperature near 36.8°C (98.2°F), although the surrounding environmental temperature may vary widely. Variations in body temperature of 0.5° to 1.5 °F during a 24-hour activity cycle are normal, but variations of more than a few degrees can be life threatening. The brain controls the regulation of body temperature, while the skin plays a key role in conserving or dissipating heat. Decomposition reactions, especially in metabolically active tissues such as the liver and skeletal muscles, are the source of body heat. When body temperature begins to rise above normal, the brain triggers dilation (widening) of the blood vessels within the skin. 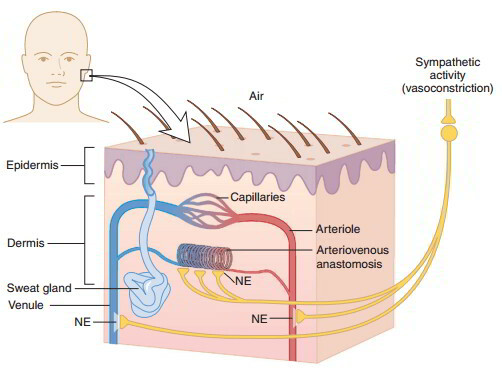 The resulting increase in blood flow to the skin increases heat loss from the skin surface. When body temperature becomes excessively high, the brain also activates eccrine sweat glands. These glands release sweat onto the skin surface and its evaporation aids in the removal of excess heat. Once body temperature returns to normal, these changes in blood flow and sweat production cease. When body temperature begins to fall below normal, the brain triggers constriction (narrowing) of the blood vessels within the skin. The resulting decrease in blood flow to the skin decreases heat loss from the skin surface. 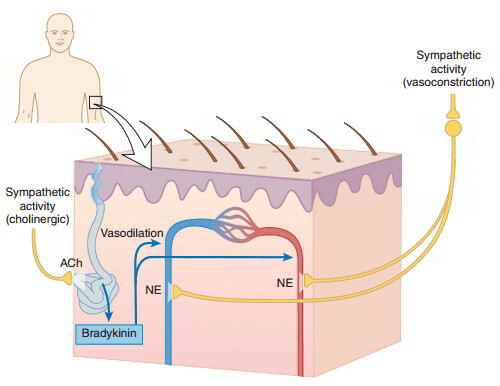 Eccrine sweat glands are not activated, so heat is not lost through sweat evaporation. If heat loss becomes excessive, the brain stimulates small groups of skeletal muscles to produce involuntary, rapid, small contractions (shivering). The increase in skeletal muscle activity increases cellular respiration and ATP hydrolysis, which in turn generates additional heat to raise body temperature. Once body temperature returns to normal, the changes in blood flow and muscle activity return to normal. Sometimes the temperature-regulating mechanism is insufficient to counter environmental extremes of temperature. Hypothermia, a body temperature below 35.0°C (95.0°F), can result from prolonged exposure to a cold environment, which overwhelms the body’s temperatureregulating mechanism. Without treatment, an initial feeling of coldness and shivering can progress to mental confusion, lethargy, loss of consciousness, and death. Persons with little subcutaneous fat (e.g., elderly or thin persons) are more susceptible to hypothermia. In treating a person with hypothermia, the body temperature must be raised gradually to stabilize the cardiovascular and respiratory systems. In hyperthermia, the temperature-regulating mechanism cannot prevent a dangerous increase in body temperature. A person with hyperthermia has a body temperature over 40°C (104°F). It can be caused by environmental factors, trauma, or drug exposure. Consider a person in an environment with both a high air temperature and high humidity level. The high humidity prevents perspiration from evaporating and cooling the skin surface. The high air temperature also decreases heat loss and, in situations where the environmental temperature is higher than body temperature, heat is actually gained from surrounding air. In such an environment, excessive physical exertion is a common trigger for hyperthermia. Persons who are dehydrated or overweight are also easily susceptible. Without treatment, progressive symptoms may include nausea, headache, dizziness, confusion, loss of consciousness, and death. Lying in a tub of cool (not cold) water is an effective treatment except in severe cases.